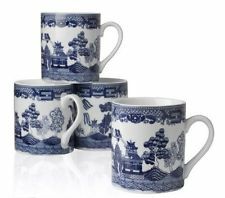 A Blue Willow mug can serve as the foundation of wonderful gifts and décor items that are sure to be loved by the receiver. Not only is the Blue Willow design beautiful, it also tells a story. It is a very popular dinnerware pattern that is collected by many. The Blue Willow dinnerware pattern has been produced by several dinnerware manufacturers since its introduction in 1780. There are a few dinnerware manufacturers that still produce this pattern. If you are into collecting, it may make sense to pick a particular piece, like a mug or Blue Willow plates, to make up a collection of the various versions of the design. These items can be used for décor as accessories which coordinate well with blue and white décor. Of course, there are currently produced dinnerware pieces, which are easy to find, or the selection of antique or vintage china which can represent a great find. 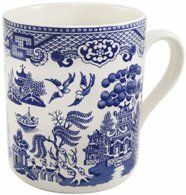 Blue Willow mugs are great for setting the theme for a gift basket. The gift basket can include some mugs, coffee or tea selections, or even breakfast items. If you want to add a touch of history, you might even consider adding a Blue Willow book . There are a couple of fictional books with the title "Blue Willow". There are also Blue Willow recipe books. A collector would love a collector's and valuation guide. Fabric is available with the Blue Willow design, and kitchen items, like dish towels and potholders can also be found. These items are great for making a gift basket complete. A mug can also serve as the base of a flower arrangement or the all popular candy bouquet. The possibilities are really endless and this timeless pattern serves well in creating original, home-made gift items. 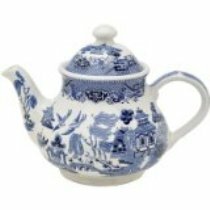 If you want to step up a notch, you might consider using a Blue Willow teapot as the base of gift items. It looks wonderful filled with flowers and can serve as a long-term décor item. You can't go wrong using Blue Willow china in gift items. All of the pieces are just beautiful and with a little bit of history behind the design, it can really be seen as a thoughtful gift.